A Crib, Toddler Bed, and Full Bed all in One! From those first few nights right through to adulthood, a good night's sleep is an essential component of a happy and busy life. This convertible crib is handcrafted from solid wood to a design that can be easily converted into a daybed and a full-size twin bed as your child grows up. This Amish made convertible crib is built to provide your chile with a beautiful and safe bed from the time they are born until they head off to college. Like all of our Amish cribs, this particular piece has been tested and approved by the federal U.S. Consumer Product Safety Commission. Their website's Safe To Sleep Center offers a wealth of free videos, articles, and how-to guides that provide the most up-to-date information on how to make sure Baby's nursery is as safe as can be. The French Country's unique look finds its roots in its enchanting mix of classical European curves near the bottom and more modern, contrasting shapes nearer the top. Its two top curves - one convex and one concave - play off of one another for a seamlessly beautiful effect that will last the piece from its time as a crib right up to its time as a bed. This mix of styles assures that this crib will keep its good looks through many decades of evolving fashion and decor, keeping itself ready for use by as many generations of your family as possible. 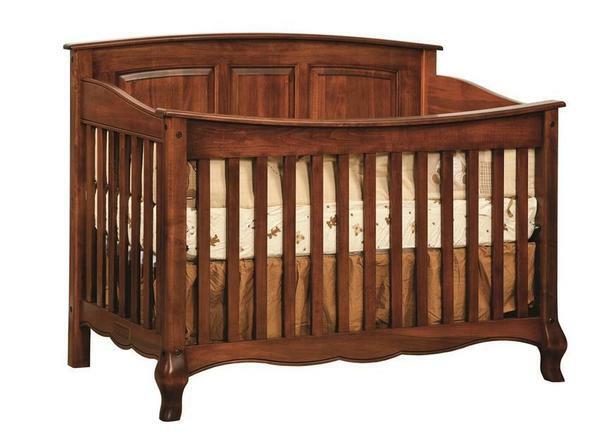 We're proud to offer this exceptional crib in your choice of solid wood and stain. Customize this convertible crib with plenty of options available. If you run into any questions at all, don't hesitate to get in touch with one of our Amish Furniture Specialists by phone or by email. Our phone number is 1-877-272-6773 and our email address is Questions@DutchCrafters.com. We would love to be a part of your family's nursery story by providing you with a high quality, handcrafted convertible crib. Thank you for shopping with DutchCrafters!